I have spent the last few days at the Symex Conference in Palembang, Sumatra, speaking and listening to a bunch of bright, articulate and challenging speakers. It has lead me to a conclusion about a significant challenge that corporates around the world face over the next few years….a convergence of issues or perfect storm which have the potential to change the corporate landscape as we know it. I’ve referred to the Gallup survey of 2012 in the past but it’ worth reiterating: 13% of the global workforce are positively engaged with their organisation. The rest are either indifferent or looking to leave. In my experience, that translates directly to a reduction in productivity levels and in innovation. In certain functions, this is compounded by a chronic skills shortage. For project managers in the Asia Pacific region, a recent survey suggests that for one third of advertised roles, there are either no applicants at all, or those that apply do not have the technical or people competencies to perform the role. The rapidly aging population in Europe, US and North Asia which creates a situation where overall economic activity will reduce over the next 5-10 years. Against this rather depressing context of declining / selective productivity, are a set of requirements below which need, above all, greater agility, innovation and engagement on the part of the workforce. A recent Ernst & Young survey talks to the increasing investment in R&D, Technology, geographical expansion and overall change in product and services mix for the 2014 / 2015. M&A has once again become a significant factor in corporate strategy with volumes of transaction hitting pre 2008 levels in certain sectors. Greater interventionism from both government (in the case of acquisitions and entity structure) and global / local regulator, leading to more challenging and complex capital and reporting requirements. In some cases, countries such as Indonesia are enforcing a regulatory climate where all customer data needs to be held onshore, leading to a rapid expansion of data centre facilities as an example. 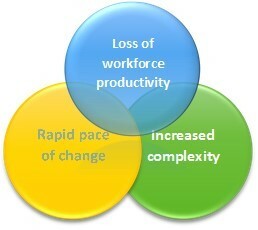 The impact of globalisation on supply chains, customer requirements, resourcing etc. Technology…providing both solutions but also major roadblocks to change for those with legacy systems. The continuing rise in expectation and knowledge of customers based on their ‘global’ reach. I will explore the implications from a programme and project management perspective next week…but in the meantime, would welcome examples of where you see this happening right now…or indeed, where you don’t! Preparing for a mid afternoon 30 minute speaking slot at a conference – the nightmare scenario! Apologies Ben, many happy returns for yesterday – its been a little busy here !